Today I’m going to show you a little trick for for how to get your curtains to hang straight. I am all about the cheap curtains. As long as they don’t look cheap. 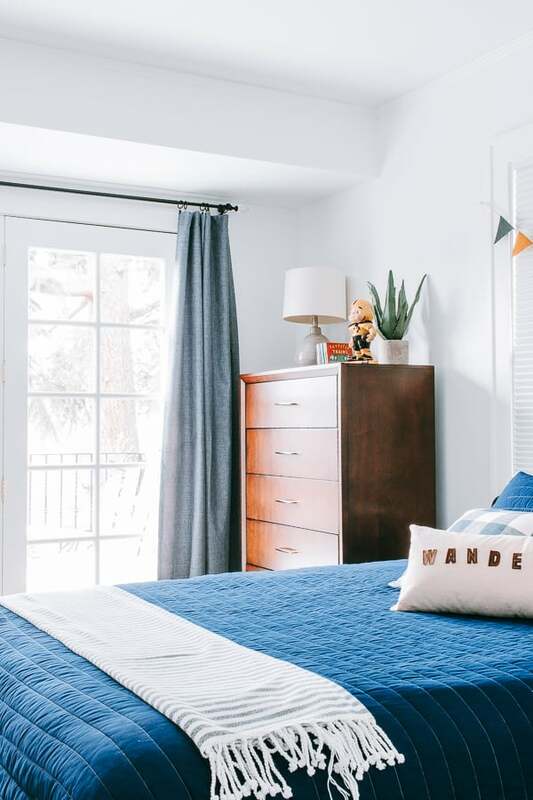 What tends to separate the fancy curtains from the cheap curtains is the nicer fabric used, the nicer liner on the back and the inclusion of drapery weights in the bottom. In order for curtains to hang straight, there has to be some heft to them. The weight of the curtains will work with gravity to pull your curtains to your floor and keep them from billowing out. And looking …. well … kind of cheap! I was looking for nice blackout curtains for my son’s room since we moved back into the house. The last time I tried to make blackout curtains it was friggin’ disaster. So forget that. I am in LOVE with IKEA curtains and they also have an option for a blackout lining. Only, I don’t live near an IKEA and I didn’t really want to spend $30 shipping a pair of $20 curtains. UPDATE : One of my lovely readers informed me that small items at IKEA now ship for $9. Everything but furniture! This is great news guys! So I swung by Target to see what they offer. Fortunately, I didn’t need long curtains. That’s the one thing about Target – it’s hard to get anything longer than 85 inch panels in the store. Have you guys had that issue too? Anyways, I found these adorable blue textured BLACKOUT curtains at Target from their Made By Design line. They were $20 for a pack of 2! 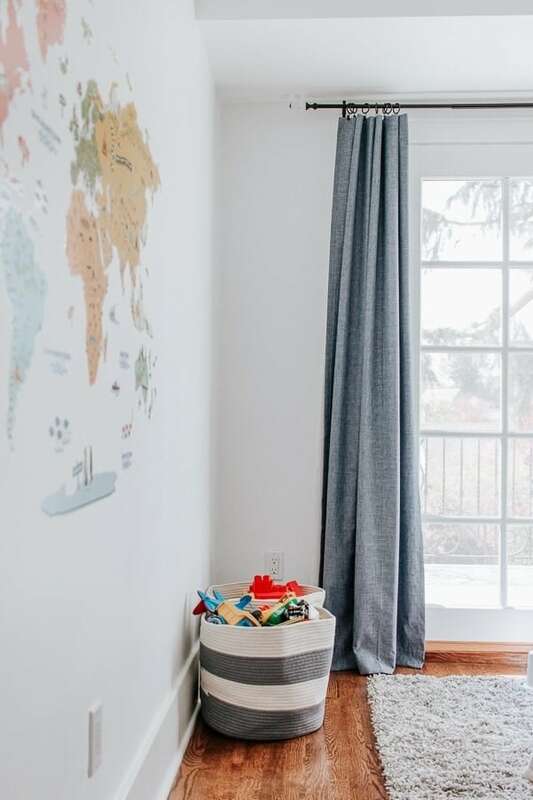 I can’t find them on the website anymore but they have so many great curtain options at affordable options! LOVE! The only problem with them? I initially took them right from the package to the curtain rod because I had to get them up quick. See how they are wrinkled and stick out at the bottoms and the top pleats are kinda meh? They block the light pretty well but they are not thick curtains so there is no weight in there to help them hang down straight. 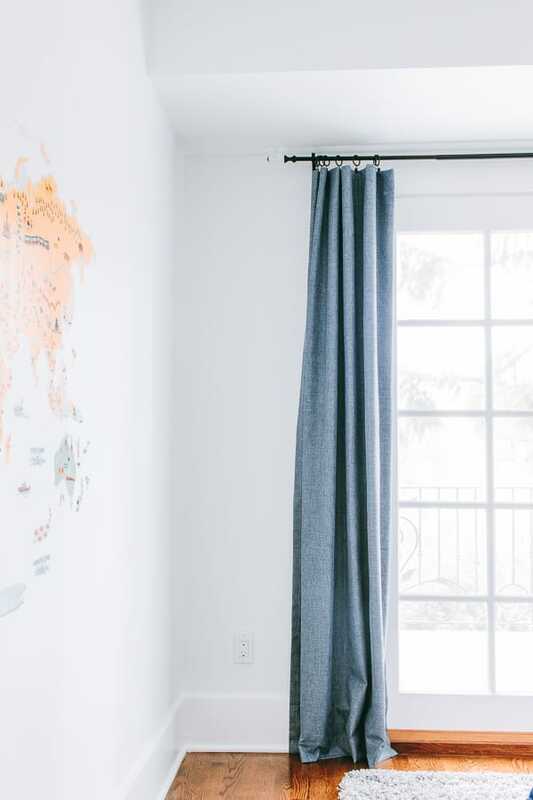 Here’s how to get your curtains to hang straight! Step One : Iron them really really really ridiculously well. Curtains typically come folded up in neat little packages. Even the fancy ones do. You have to iron out all those fold marks and wrinkles or it will be a hot mess trying to get them to lay the way you want. Step Two : Install Curtain Weights. Don’t go and buy the fancy drapery weights with lead in them. I think they are expensive for what they are and they have lead in them. If you have kids, these things will keep you up at night. Don’t do it. Take 4-6 pennies and insert them into the hem (in all four corners) at the bottom of the curtain. Ok, if I do the quick math you will need between 16 and 24 cents worth of pennies. You can also use a large magnet at each corner instead of pennies. My hardware store sells them for 25 cents a piece. They are a good heavy weight, but again – you need to really make sure your kids can’t get at them. The pennies work just as well and for 24 cents you can’t beat it! Anyways, after putting your pennies in the bottom hem corners, take a little fabric glue and seal the hems shut. 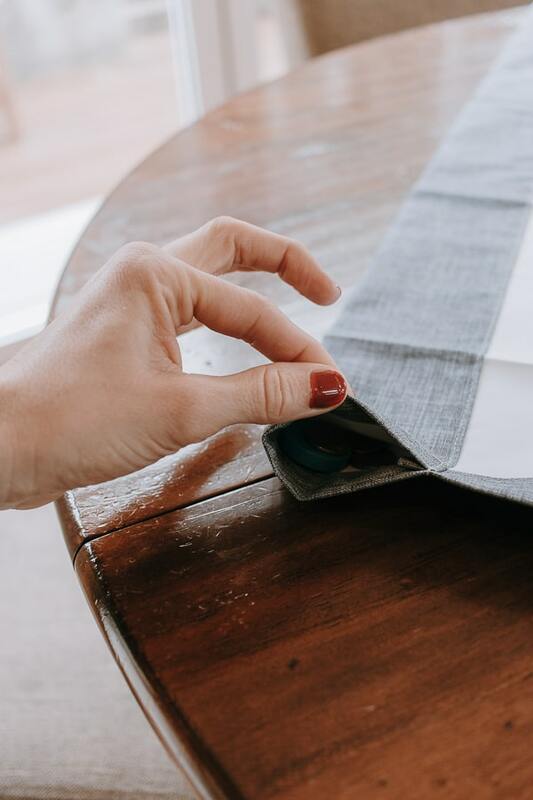 You can also just sew a straight seam to seal it up quick. 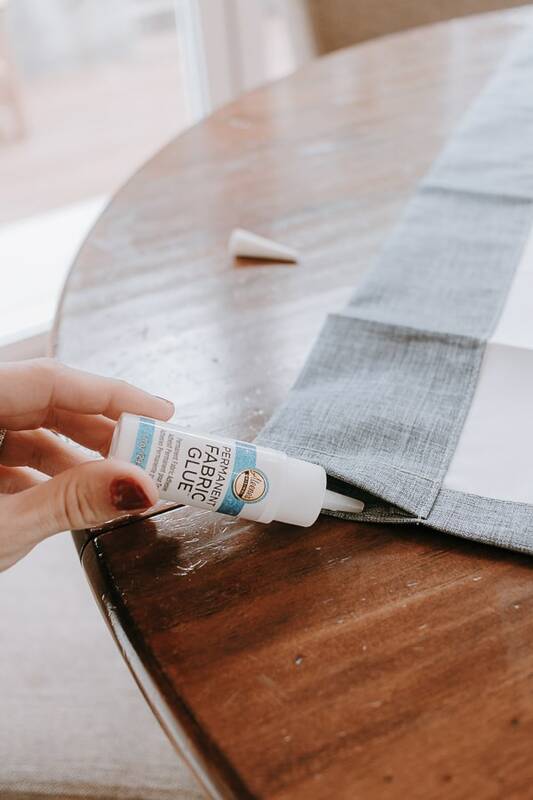 I just used fabric glue because I was seriously too lazy to go downstairs and get my sewing machine out. I also put one pin in each corner (with the pin point in coming out the back) just to make sure nothing is going to slip out while the fabric glue dries. 24 hours to be sure. And that’s it! 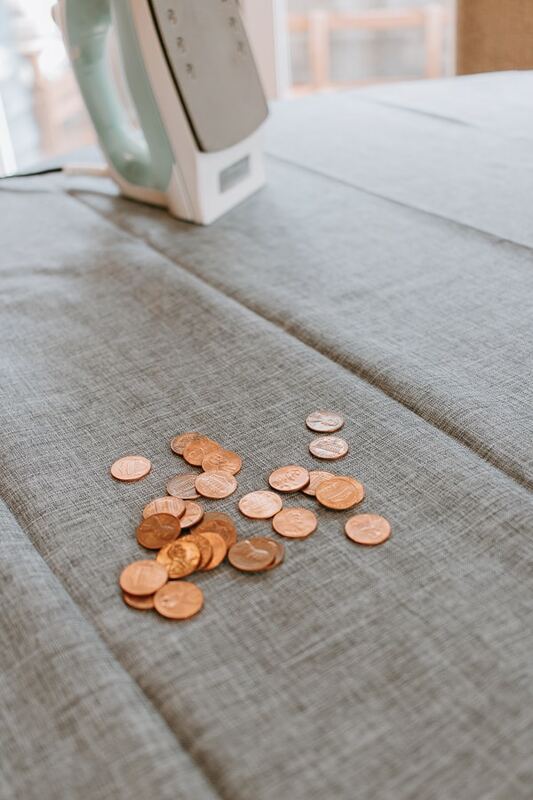 The pennies will stay in their corners (and be good pennies) pretty much provided you are not being oddly aggressive with your curtains or twirling yourself up in them everyday. I just realized this sounds exactly like what my kids are capable of. Ha. Ok – don’t give them any ideas. For the most part, opening and shutting your curtains will not displace the pennies. And you will find that they hang SO MUCH BETTER! 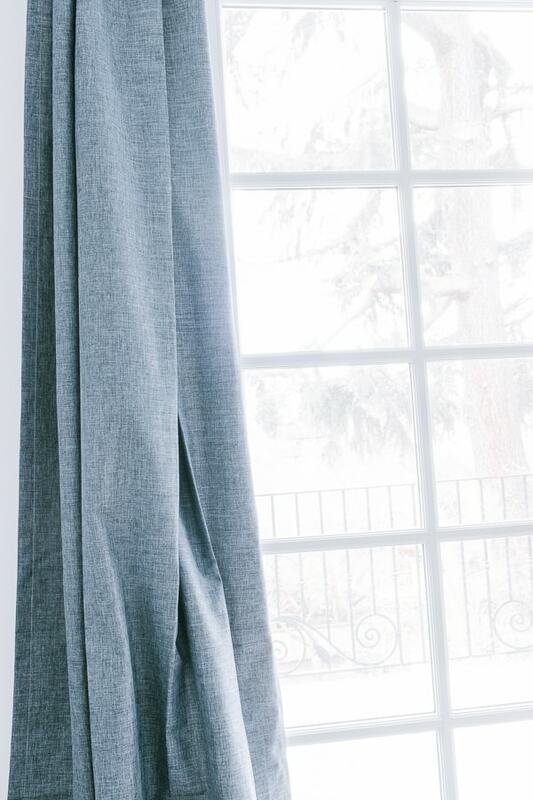 But wait – here’s another tip to getting your curtains to hang straight. 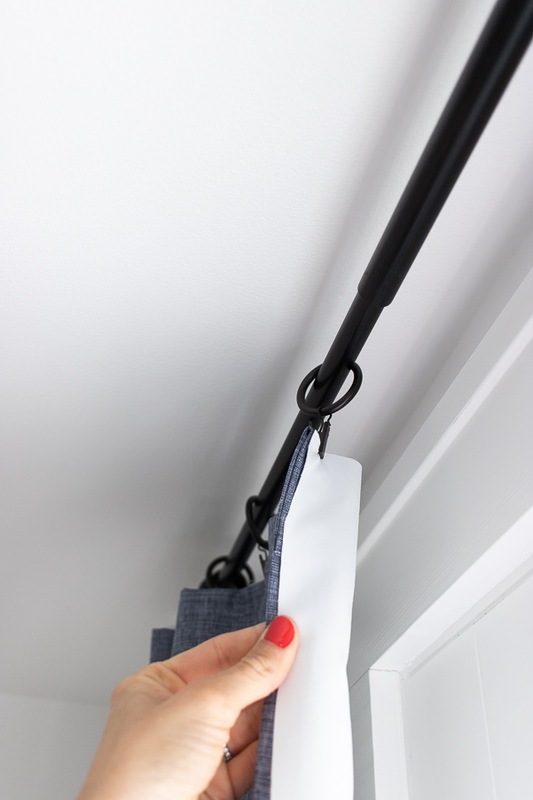 Yes you can put them directly on the pole but I find it so clumsy to open and close them this way and they hang much nicer when you use drapery clip rings. I used these Amazon Basics Drapery Clip Rings and they work fantastic. 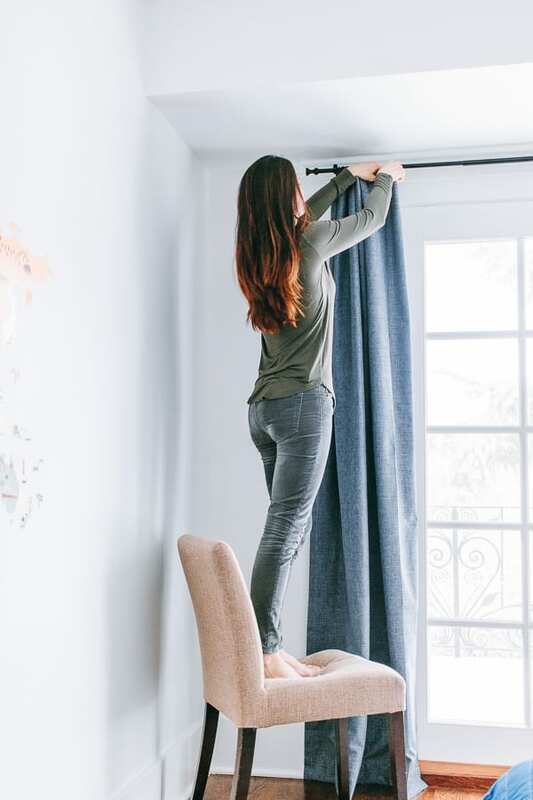 Hanging your curtains from drapery clips also makes them touch the floor a bit more creating that pretty “kiss” of fabric on the floor. And they just look so much more elegant. 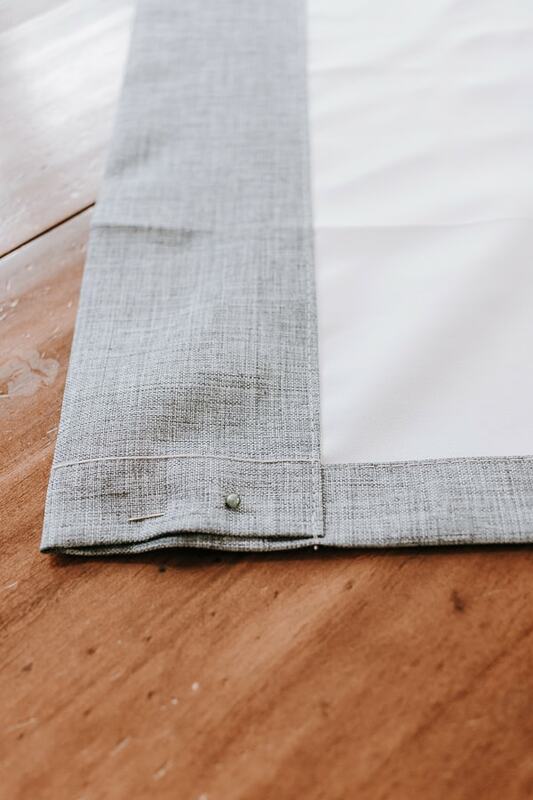 To get the clip rings in the right place, just make evenly sized pleats with your curtains and place the clips at the in-between section of each pleat in the back. Here’s how the curtains look after! This makes such a difference. You really don’t need to buy the fancy super expensive curtains as long as you doctor up the inexpensive ones a bit. What do you guys think? Much better, right? Here’s another tip I just discovered! 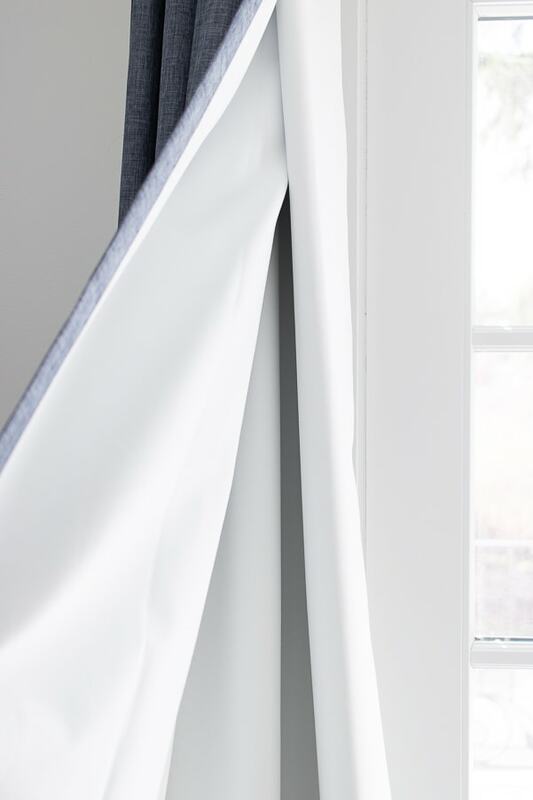 Adding a simple blackout liner to the back will add even more heft to your curtains – causing them to fall and lay even better and nicer. I wanted more blackout to these Target curtains. 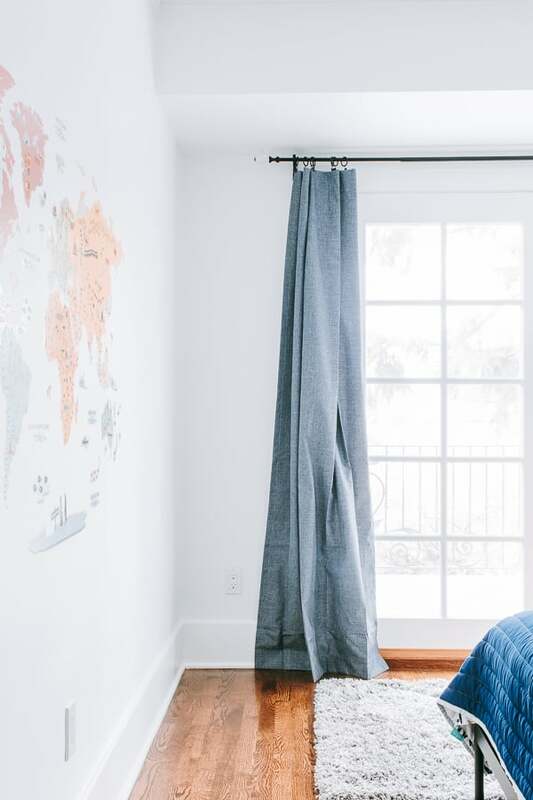 The sun just beams through my sons room in the morning and if I can get even 5 min more sleep – I’ll take it. So, I bought Roc-Lon Blackout Drapery in White and just clipped them up to the back of the curtains (cut them to the size of the curtain). I have not sewn them in yet, but may to have eventually as the clips can rip the blackout liner, potentially. This is a great option if you want real BLACKOUT curtains but don’t want to spend a fortune on them. (My last attempt at Blackout drapes didn’t work so much). This is so much better! And these curtains went from $10 Target curtains to expensive, weight-y, Pottery Barn lookalike blackout drapes. Win! ♥ Thank you so much visiting with me today! 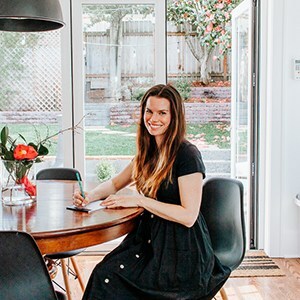 ♥ Follow me on Instagram for more tips, cool finds and more of our crazy daily life. More Posts for you to Enjoy! IKEA has one flat shipping rate of $9 for everything except furniture. Order all you want and it only costs $9 to ship. Just FYI. Anne! Thank you so much for the information! I didn’t realize that shipping for small items was down to $9 at IKEA. This opens up a whole new world of possibilities for me. 🙂 I’m going to update the post! Yes! You can find some really great options at Ross and HomeGoods. I wish I was better and more patient with sewing my own! Good for you!